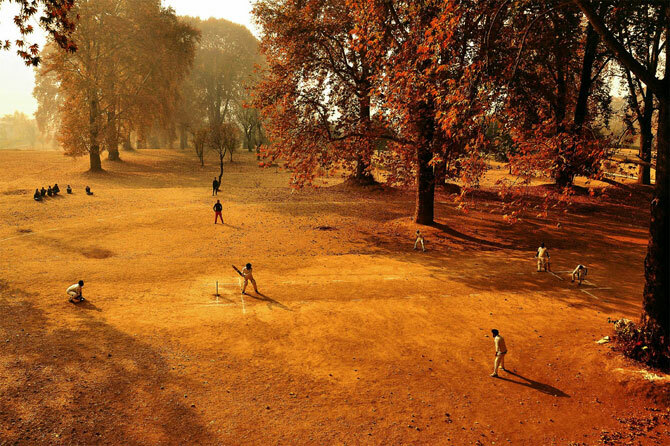 An Indian freelance photographer won the 2016 Wisden MCC Cricket Photograph of the Year competition for a colourful image of a boys' cricket game in the Mughal gardens of Srinagar. Saqib Majeed, a photojournalist of eight years, came across the scene on a visit to Nishat Bagh -- one of the most famous Mughal gardens. Shooting from a vantage point of 35 feet up, Majeed was able to capture the entire game amongst the autumnal colours of the surrounding chinar trees. Philip Brown's image of Bangladesh’s Shakib Al Hasan batting against England during the First Test in Chittagong was one of two equal runners-up. International against Australia at the Melbourne Cricket Ground, said a report in the Lord's website. Kohli, who enjoyed a hugely successful year, featured more than any other player in the competition entries. As winner, Majeed is awarded 2,000 pounds, while Brown and Ratnayake win 1,000 pounds. All three images appear at the beginning of the colour section of the 2017 edition of Wisden Cricketers’ Almanack. The seventh year of the competition saw more than 450 entries from around the world, with photographers of all levels of experience capturing a huge variety of cricketing moments. The shortlist, runners-up and eventual winner were chosen by a judging panel chaired by former Chief Sports Photographer of The Sunday Times, Chris Smith, and including world-renowned cricket photographer Patrick Eagar. The former art director of The Cricketer magazine, Nigel Davies, was also on the panel, along with music photographer Kevin Cummins.